This picture shows raw chicken sent to the family of six on Thursday night. The chicken was part of a 7.99 meal deal which included three chicken wings, three chicken thighs, a can of drink and chips. A Northampton kebab house is under investigation by the Guildhall after sending a family of six uncooked chicken. On Thursday (November 15) Karmen Lewis and her family, of St James, placed an order at 7pm with Heaven Kebab House through third-party delivery site, Just Eat, to feed her family of six including her 10-year-old granddaughter. Karmen said the fish was under cooked. Upon arrival, the £40 order, which took over one hour to arrive, included two portions of chicken included in a £5.99 and £7.99 meal deal, that was pink and oozing blood. She said: "My granddaughter bit into it and she said: 'is chicken meant to be bleeding?' I nearly vomited to be honest. "It was a 10-year-old child - she could have ended up in hospital if she was not food wise. "What I want to know is where are they cooking their food? It was not even a little order, it was £40 and it all went in the bin." Karmen's 10-year-old granddaughter asked whether the chicken should be pink. Karmen also ordered fish and chips which she described as "undercooked". "The fish or should I say, the tail of the fish, they sent was undercooked and cost £6. "I phoned the company to take the food back and they told me there was no shop." An investigation was launched on Friday night by Just Eat and a spokeswoman at the third-party site said the restaurant web page has since been removed. Karmen has since been offered a refund from Just Eat after putting her full order in the bin. A spokeswoman for Just Eat said: "We take food safety seriously, any restaurant wishing to partner with us must be FSA registered and provide evidence of this, before we put them on our platform. "We can confirm that we have taken this restaurant offline and have launched an immediate investigation. "We want our customers to have a positive experience when ordering their food online and we were sorry to hear that in this case, this customer's experience with the restaurant partner did not reflect the standard we would hope to deliver. "We are in contact with the customer to issue a full refund." Heaven Kebab House has a four and a half star rating on Just Eat and 17 people have left mixed reviews. One person called Thomas said: "Multiple items missing from the order, food quality is very poor and is impossible to find a number to even call them to let them know there was stuff missing. Will not be ordering again." Brandon, who also left a review, said: "Amazing food, delivery driver friendly. I’ve found my new takeaway." 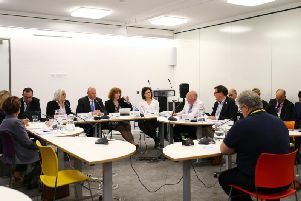 Councillor Mike Hallam, cabinet member for environment, said: “We take food safety extremely seriously and investigate all complaints that we receive. Heaven Kebab House refused to comment when contacted by the Chronicle & Echo.